What is the Precious Cross for Orthodox Christians? The Cross is the symbol of sacrifice, the ransom for the salvation of our soul, the guarantee of eternal life. However, apart from being a symbol of sacrifice, triumph and victory, it’s also a symbol of pain and anguish for each of us. Our life is interwoven with suffering and the Cross. Christ’s Cross is a sacrificial altar. On it, the Lamb of God was slain. It’s the means by which the devil was defeated, sin destroyed, and our spiritual freedom pledged. The Cross is the strength and glory of all the saints throughout the ages. The Cross is the cure of the passions, the exterminator of the demons. The Cross is deadly for those who don’t transform their own cross into that of Christ, who bewail their lot under their cross, not trusting in God’s Providence. It’s a cross for those who condemn it and blaspheme it and who surrender themselves to hopelessness and despair. Saint Theofan the Recluse gives us his own answer to this question, saying that the Cross: ‘Is all the trials, stumbling-blocks and sorrows- the great weight of which bears down on our shoulders externally and internally- as we tread the path of consciously observing the Lord’s commandments. Such a cross is self-evident for Christians, to the extent that, wherever there are Christians, you’ll find one; and where there isn’t one, you won’t find Christians’. The faithful believe that when they make the sign of the Cross in all their actions and on all the paths of their life, in every contact they make with other people and with nature, the Holy Spirit is also defending them. There’s a special relationship between the Cross and the Holy Spirit, because the Cross is the human effort at cleansing, while the Holy Spirit is the purifying divine power. They go together. 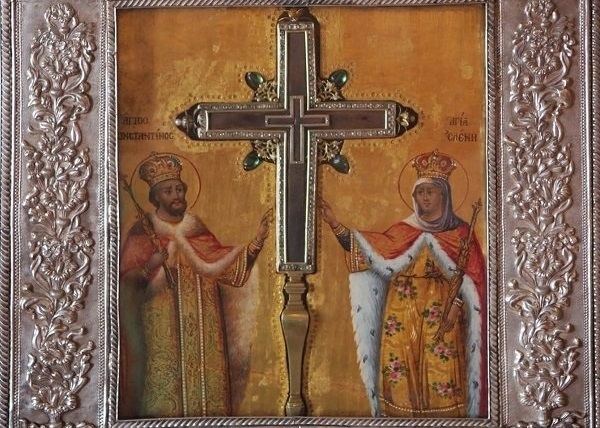 Saint Germanos, Patriarch of Constantinople, lauded the Honourable Cross, which was presented for veneration by devout Christians, as the ‘royal couch’ . A couch on which the Son and Word of God, our Lord Jesus Christ, lay during His terrible sacrifice on Golgotha. My beloved friends, we should know that, behind the Precious Cross is concealed the Resurrection of Christ, and, behind our own cross there’s our own resurrection, which is why the third Sunday in Lent is an invitation to the feast of the Cross and to the crucifixion of our own passions. Therefore, with our veneration of the Precious Cross, may we remember that the first to die on the Cross offered His life for the salvation of the world. This is the deeper meaning of the veneration of the Precious Cross. It’s the most wonderful struggle, which brings us the salvation of our soul and the eternal glory of the Kingdom of Heaven . We need the support and the blessing of the Precious Cross in the whole of our life. Each of us needs a prop, a crutch which will sustain us and keep us upright. And this support is the Cross of our Lord. 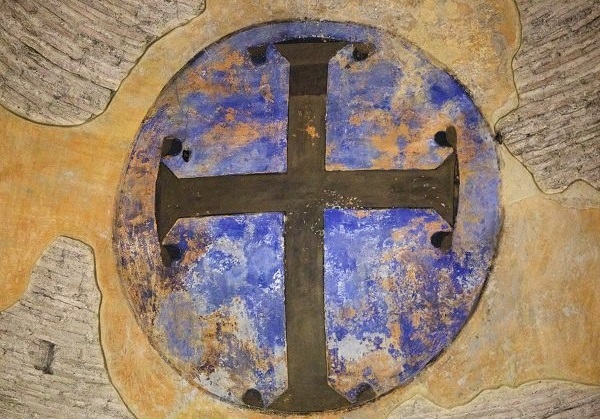 A Byzantine orator of the 10th century, Nikitas from Paflagonia, urges us never to cease elevating and venerating the Cross on a daily basis, until we manage to get through the wicked years of this life and its difficulties. Just as it’s not possible for us to survive without the light of the sun, so our soul can’t live in accordance with the will of God without the spiritual rays of the Cross of Christ . May we have the power of the Cross as a weapon and support in our efforts to overcome the difficulties and hindrances, the sorrows and trials which torment us, and may we seek God’s mercy. Let us take up our own cross and follow Christ. I wish you a good Great Lent, for what remains of it. 1. Saint Germanos, Patriarch of Constantinople, Discourse on the Veneration of the Precious and Life-Giving Cross at the Mid-Point of Lent, PG 98,240D. 2. Archbishop Timotheos (Papoutsakis) of Crete, Ομιλίες στα Κυριακά Ευαγγέλια, Athens 1956, p. 143. 3. Nikitas Paflagon was a Byzantine author from the 10th century. In his theological works, he emphasizes the contrast between the all-powerfulness of God and the lowly position of human people.